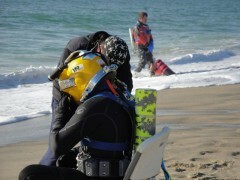 VRHabilis was contracted to carry out UXO clearance operations using the “MAG and Dig” method, of selected areas in the waters off the south shore of Nantucket Island, Nantucket, Massachusetts. The purpose of this contract was to locate, identify, and remove leftovers of military weapons in this area due to military training during WWII. The VRH team completed the “MAG and Dig” operations from the shore using a dive trailer, which was towed onto the beach. Using GPS data for location, grids were marked and the dive trailer moved between grids. Using a Schonstedt ferrous metal detector, a UXO qualified technician searched each grid from the high water mark to the water’s edge. Then a UXO qualified Diver entered the water and did a “Jackstay Search” of the bottom of each grid. Any Schonstedt instrument responses which suggested the presence of a surface or subsurface item was investigated. During the course of the project, VRHabilis checked all “Material Potentially Presenting and Explosive Hazard” (MPPEH) found by dive personnel, and removed five “Material Documented As Safe” (MDAS) items, and 5 “hot rocks.” No MEC was found.